Every student knows how difficult it can be to stay on top of everything. Exams, assignments, papers, and classes: these are just some of the things that a student has to successfully juggle during their week. If a student is well organized, they should be able to get through their week with minimal stress, and even have time for a social life. Using a student weekly planner template can be a great way for students to plan their academic year to the best of their ability. Any student will know that money can be in short supply while you are studying, but this weekly planner template for students is free to download and easy to use. It can be used in Microsoft Excel and is fully customizable to suit the needs of any student. The student assignment planner template includes an interactive calendar that allows students to change the calendar year that they want to use the template for at the click of a button. In this calendar, students can highlight a date of importance, so that the important days in a month are visible immediately. Under this calendar, there is a weekly schedule section in which students can enter information about what classes they have and what time they are at. Next in the student assignment planner template there is a section entitled ‘Assignments’. This is laid out like a notebook, with a few lines for each day. On these lines, students can write in information for each day in the month. For example, students can write in the information for every Monday in the month in the ‘Monday’ section including the date. 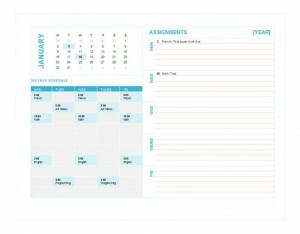 At the bottom of the weekly planner template for students, there are tabs for every month of the year. This will allow students to accurately plan their entire academic calendar for the year. It’s a good idea to accurately and neatly file any information you get about assignments or exams. This will make organizing your planner easier. You should make it a point to enter any relevant information about your studies as soon as you receive it. Enter any information that you think will help you to be organized as a student. If this includes the smallest of details, then enter it anyway.